Jamil Fakhri’s Inspector Jaffar Husain, an ostensibly devious man with a deep conflict of conscience within him, was a treat to watch. 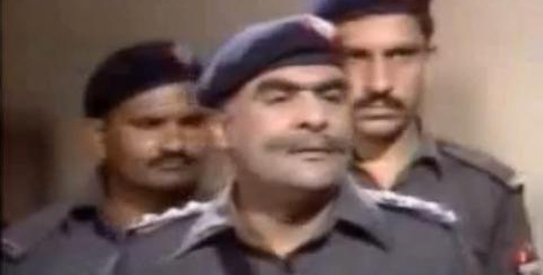 Jamil Fakhri, an actor of immense talent and versatility, died on Thursday night in Lahore. The last few years had been particularly tough on the veteran actor. As a parent, he had his worst fears come true when the tragic death of his son Ali Ayaz Fakhri, who had disappeared in the US, was confirmed. The last recorded images of Fakhri, with pain etched on his face as he mourned the loss of his son, are tough to watch. Though no longer with us, he continues to be in the hearts and minds of his fans for his performances, particularly the portrayal of Inspector Jaffar Hussain in Andhera Ujala. The series went on air in the early 1980s on PTV and is a cult classic. Fakhri’s pair with comedian Irfan Khoosat (as Hawaldar Karamdad) is still remembered by admirers of PTV’s yesteryear glory. If Irfan Khoosat’s Hawaldar Karamdad was a simpleton, blabbermouth of a character, Inspector Jaffar Husain was an ostensibly devious man but with a deep conflict of conscience within him. Not only did he do justice to the sharp script penned by Younus Jawed, but the mannerisms that Fakhri adopted (pulling his pants up every time he left the police station or reprimanding his sub-ordinates haughtily, were a treat to watch. There’s an episode in Andhera Ujala in which Jaffar Husain suffers a personal loss and his perspective on life undergoes a sea-change. It’s a brilliant portrayal of an official trying to come to terms with the duplicity that exists in his department as well as with the conflict within his personality. Fakhri took part in many television plays and played all kinds of characters. His effort in Aik Haqeeqat Aik Fasana, cameo appearances in the iconic comedy series Alif Noon, meaningful roles in Waris and Pyas are some of the finest examples of acting on Pakistani television. Jamil Fakhri also branched out into films. When his friend Irfan Khoosat made Direct Hawaldar, he was with him. The film did a roaring business. A couple of other memorable movies were Dahleez and Mehrban. He was an actor who was original in his approach to acting, or as many of his colleagues would say, he was in a league of his own. Jamil Fakhri had also worked in a number of theatre plays, both commercial and parallel, and earned critical and commercial acclaim. He was a through and through Lahorite, someone who took pride in being from the old walled city. He was a legend and unforgettable.We all will miss him so much. my dad was a big fan of Andhera Ujala becasuse of Jafer Hussain and Hawaladar. irreplaceable indeed! I am really shocked. He was such a wonderful artist. I have seen complete series of Andhera Ujala and can safely vouch for it that he measured up to the performances given by Khoosat and Kavi. Heartfelt condolances. We have lost a Genuine Actor in a Row, who has given Pakistani Viewers wonderful moments of Original Acting. May god bless his Soul n give strength to his family. Allah give him eternal peace hereafter. He was a great man Aameen. If we talk of that traditional golden era of PTV, he was a super star of PTV Lahore Centre. One of the finest our TV drama industry has produced. Jamil Fakhri was one of our best. May Allah(SWT)give him Junna. Amin Sum Amin. I am still watching his unforegetable dramas on Youtube. Another irreplaceable loss.He was one of the finest actor our country produced and will be missed for ever.May Allah rest his soul in peace and give his family the courage to bear this loss amin. Artist never dies.He lives in the hearts FOREVER! May Allah bless Fakhri's soul. Amen. He was a great actor, I still remember watching him and Hawaldar Kamardad when i was growing up in mid 80s. I still watch this on youtube. I told my wife about passing away of this great actor and she felt really bad. I wish his soul rest in peace and May God bless everyone in his family a strength to bear this loss. Inalilahay Winahalhay Rajaioon, While praying for his family to bear this irreparable loss, he was great asset of Pakistan and true Lahori. May his soul rest in peace. A wonderful performer and humble man is no more with us but his work and performance will be remembered for a long period. Jamil Fakhri is good actor and very good person . It is very great loss for the nation and Tv station. May Allah rest in soul. When even a single American in just custody in Pakistan the whole America comes into motion and get hand to their national. This Great Artist Late Mr.Jamil Fakhri lost his son and we all respected him and will always do so, but what did our useless government and politician did for this artist when he lost his son in USA? Did anyone try to launch a deep investigation into the matter, its a SHAME on Mr.HUSSAIN HAQQANI who's Pakistani Ambassador in the USA that he DID NOTHING. Really a great actor. I think he also was in Kashkol, another great hit. From God we come and to him is our return. May his soul rest in peace, Amen. Met him recently 1 month ago, at Shadman Lahore. His driver had parked his car behind mine. I saw J.Fakhri and couldn't recognize him instantly. He had grown "old" in more sense than one. This was the 1st and last time I met him in person. I introduced myself and we stated chatting and he told me about his latest projects. He had so much pain in his eyes, but he vowed to move on. He was getting his eyes sorted out from Shadman, he told me. As I said my Good bye, he patted my head and said "jeti raho baiti" (Long life to you, my daughter.) And at the moment I really felt I had known him forever him, as a Father. That one time I met him by the fate and his memories will be with me forever. May you be in peace, love and happiness, where ever you are. Amen.